You can present your salad in the most beautiful way, with this GreenGate Abelone White salad bowl. 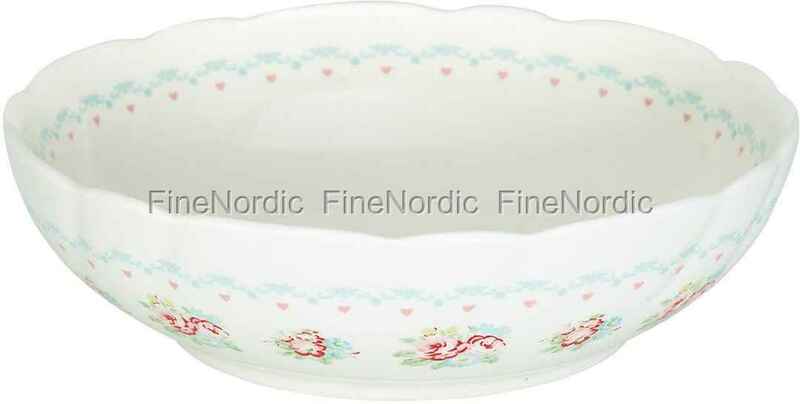 Its romantic farmhouse look, and nostalgic form, make this bowl a real eye catcher. And no matter if green salad, fruit salad, potato or pasta salad all this and more can be served to your guests in this attractive bowl. You can also use it as a fruit bowl on the kitchen counter. That way the fruit is safely stored, plus the bowl will serve as a nice decoration. The romantic Abelone pattern consists of red hearts and flowers and also the colors light blue, yellow and light green are present in the pattern. The Abelone White salad bowl can be combined nicely with many other GreenGate series. Oi vocês enviam para o Brasil?